Can’t go vegan because you miss BBQ too much? Gone vegan but miss BBQ? 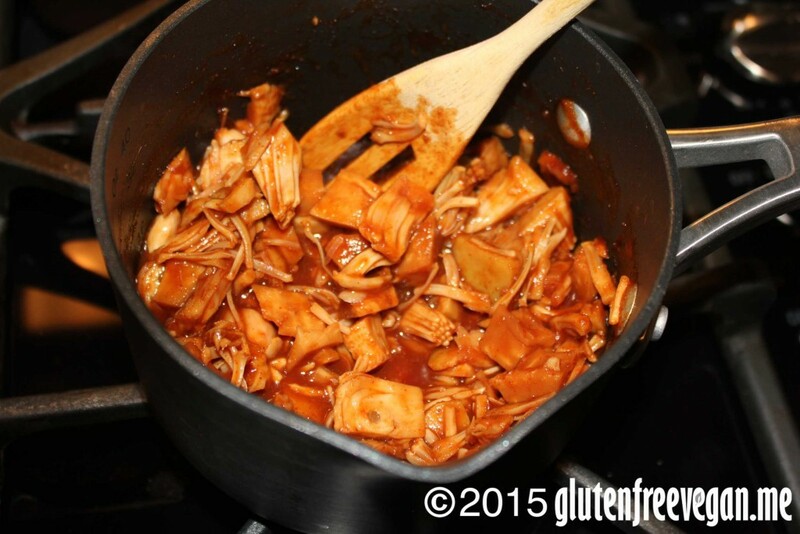 Have you tried young, green jackfruit BBQ? If you have, you’re probably hooked like me. If you haven’t – you need to find out what you’re missing! Jackfruit is one of the largest fruits in the world. Ripe, it inspires the flavor for juicy fruit gum and is very sweet. But, young, green and canned in water, it resembles the texture of chicken or pulled pork, without any of the cruelty! It’s a perfect substitute for chicken, pork or pot roast in your favorite recipes. Today, I’m making it with BBQ sauce. For the sake of time, I’m using pre-bottled sauce but you can easily make your own. Simply open your can of jackfruit. Make sure it’s the young, green packed in water variety – not ripened, fresh or packed in sugar. Drain the water and gently break apart each piece so it becomes the size and consistency you prefer. I also chop up the young seed pods to keep them the same as the fruit. They taste just like the rest of the jackfruit at this stage so don’t waste them. Add enough BBQ to completely coat your jackfruit and cook on medium heat until it boils. Reduce heat. Spoon the mixture onto your favorite gluten-free bread, rice or potatoes or use it to top a salad. This entry was posted in main dishes, Meals in Minutes, Recipes, Vegan Information and tagged BBQ, gluten-free, gluten-free vegan recipe, glutenfreevegan.me, glutenfreeveganme.com, jackfruit, sandwich, vegan cooking, vegan recipes, zesty. Bookmark the permalink.